University of Roorkee (now Indian Institute of Technology, Roorkee) B.E in Mechanical Engineering, 1985. Director (NCR Centre) at the University of Petroleum & Energy Studies. Responsible for complete functioning of the Centre which had about 400 students. Later, Vice President (Academic Administration) at the same university. Taught courses on “Operations Management” and “Supply Chain Management” to MBA students. Supervised a number of dissertations for MBA students. 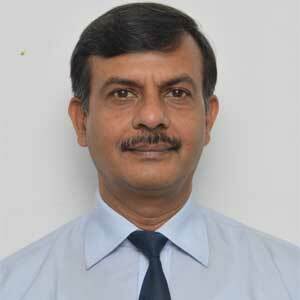 Associate Professor at Institute of Management Technology (IMT), Ghaziabad in the area of Operations Management. Taught courses on Operations Management and Supply Chain Management at the Institute. Part of the syllabus review committee which was assigned the task of reviewing the portfolio of courses offered every term by the institute, and their detailed contents. Responsible for publication of the placement brochure for Executive Management students. Supervised summer internship projects for post graduate students. Logistics Planning Manager with Indo-Mobil Ltd, a joint venture between Indian Oil Corporation and Mobil. The JV was in the business of manufacturing and marketing lubricants in India. In charge of preparing monthly production and distribution plans. Later Regional Logistics Manager-North, in charge of complete operations in North India. Project Manager with Tide Water Oil Co (India) Ltd for setting up a lubricating oil blending plant near Delhi at a cost of Rs 100 million. Responsibilities included: prequalification of contractors, co-ordination with contractor, consultant and architect for execution of work at site, monitoring of physical progress of work at site. Oct 1993 to Sep 1994 Deputy Manager Projects with Jay Bharat Maruti Ltd which is an ancilliary to Maruti Suzuki India Ltd). Worked on planning for facilities for short and medium sized batch production. Materials Officer with Bharat Petroleum Corporation Ltd which is a premier organization in the petroleum sector in India. Duties included procurement/disposal of material through tendering, inspection and inventory control. Engineering Officer with Bharat Petroleum Corporation Ltd. Part of project team responsible for setting up LPG bottling plants in the country. Duties included supervision of work at site, co-ordination with suppliers and contractors, monitoring of progress of work. Varma, S, Wadhwa S, Deshmukh S G (2006), “Implementing supply chain management in a firm: issues and remedies”, Asia Pacific Journal of Marketing and Logistics, Volume 18, No. 3, pp 223-243. Varma, S, Wadhwa S, Deshmukh S G (2008), “Evaluating petroleum supply chain performance: Application of Analytical Hierarchy Process to Balanced Scorecard”, Asia Pacific Journal of Marketing & Logistics, Volume 20 Issue 3, pp. 343-356. Varma, S, Wadhwa S, Deshmukh S G (2006), “Measuring productivity in the supply chain: use of the balanced scorecard”, Productivity, Volume 46, No. 2-3, pp 330-338. Varma, S, Wadhwa S, Deshmukh S G (2007) “Supply chain characteristics of the petroleum industry: The Indian context”, South Asian Journal of Management, Volume 14, Issue 2, pp 107-122. Varma, S, Wadhwa S, Deshmukh S G (2008), “Using DEA to measure performance of process industry supply chains”, IME Journal, Volume 2, No. 2, pp. 29-36. Varma, Siddharth and Deshmukn, S. G. (2009), "Evaluating petroleum supply chain performance: Overcoming shortcomings of Balanced Scorecard", Global Journal of Flexible Systems Management, Volume 10, Issue 4, pp. 11-22. Kumar, Sujit and Varma, Siddharth (2010), "Launching enterprise data back up and recovery solutions: the case of Ozonetel", International Journal of Technology Marketing, Volume 5, No. 1, pp. 15-26. Varma, Siddharth (2012), “Managing faculty demand in technical education: A supply chain model for the IITs”, South Asian Journal of Management, Volume 19, No. 4, pp. 124-136. Varma, Siddharth & Kumar, G Yohan (2016), "Stakeholder Analysis for a Cross Country Pipeline Project in India", South Asian Journal of Management, Vol 23, Issue 2, pp. 131-149. Varma, Siddharth & Gupta, Ruchika (2016), "A Study of Internet Banking Behaviour in the National Capital Region of Delhi", IIMS Journal of Management Science, Vol 7, Issue 2, pp. 245-255. Varma, Siddharth (2016), "Indian petroleum industry: some insights using Porter's Model", Journal of Energy & Management, Vol 1, No. 1, pp. 30-43. Varma, Siddharth; Chaturvedi, Arvind, Ashqar, Ashraf & Masoud, Khaldoun M S (2016), "Ready Mixed Concrete Plant: A Case Study in Project Feasibility" Amity Case Research Journal, Volume 5, pp. 20-24. Siddharth Varma, Subhash Wadhwa and S.G. Deshmukh (2008), “Performance Measurement of Process Industry Supply Chains: A DEA Approach” in Business and Competitive Dynamics, (Eds D.P. Goyal, Manoranjan P. Ram and Taruna Gautam), Macmillan India Limited, Delhi, pp-26-36, ISBN 0230-63515-6. Varma, Siddharth (2008), “Petroleum Industry in India: Overview and supply chain challenges”, in Supply Chain Management for Competitiveness, (Eds. D P Goyal; Siddharth Varma), Macmillan India Ltd, Delhi, ISBN 9780230636576. Varma, Siddharth (2009), “Expansion of technical education in India: Managing faculty demand” in Reshaping Business Analysis & Solution, (Eds. D.P.Goyal and Taruna Gautam); Macmillan India Ltd., Delhi, pp. 286-291, ISBN 023-063-826-0. Madaan, Jitendra and Varma Siddharth (2010), "Improving performance of flexible reverse enterprise system" Supply Chain Management for Competitive Advantage, G. D. Sardana and Taruna Gautam, Macmillan India Ltd, Delhi, pp 140-149. Supply Chain Management for Competitiveness (2008), (Eds. D P Goyal; Siddharth Varma), Macmillan India Ltd, Delhi, ISBN 9780230636576 . Khurana, R, Varma, S, Mandke V V, Wadhwa S (2005), “Modeling information bases with integrity in a mass customized supply chain”, Paper presented at Mass Customization and Personalization Conference (MCPC-05), Hong Kong, 18th -21st September. Kumar, Sujit and Varma, Siddharth (2009), "Marketing of Unified Data Management: A case of Ozonetel", International Conference of Business Cases (ICBC-09), November 26-27, Institute of Management Education, Sahibabad. Chaturvedi, Arvind; Varma, Siddharth; Dikko, Abdulmutallib Y. and Abdullah, Ahmad Salim, "Improving performance of a rice milling plant: Case of Kampus Agro", International Case Conference, IMT Nagpur, Goa, 29th November -1st December, 2012. Varma, Siddharth; Chaturvedi, Arvind; Ashqar, Ashraf and Masoud, Khaldoun, “Ready Mixed Concrete plant: A case study in feasibility” International Case Conference, IMT Nagpur, Goa, 29th November -1st December, 2012. Chaturvedi, Arvind and Varma, Siddharth, "Improving quality of Service: Case of an Indian restaurant in Lithuania”,International Conference on Management Cases, BIMTECH, NOIDA, 29th November, 2012. Chaturvedi Arvind & Varma, Siddharth, "Customer perception of CSR and influence on purchase behavior", 10th ISDSI International Conference, Nasik, Dec 28-30, 2016. Varma, Siddharth; Chaturvedi, Arvind & Fono, Rony, "Assessing the quality of health services: Case study of a hospital in Tonga", 10th ISDSI International Conference, Nasik, Dec 28-30, 2016. Varma, Siddharth & Gupta, Ruchika, "Effect of technological innovation on customer satisfaction in the Indian Banking Industry", Conference on Innovation, Market Competition & Economic Development, IMI, Bhubneshwar, Dec 9-16, 2016.